Rate this Article If you're looking for games that are almost 100% like the old Club Penguin, you're definitely in the right place! We've curated and compared 3 of the best ones we've found. When Club Penguin announced that it will be shutting its doors after more than a decade, it shattered the hearts of its fans from all around the world. Many young adults today can probably attribute a rather big fraction of their memories to the many fun and good times with online friends on Club Penguin, and as such, it’s not surprising to see many of them turning up in the game’s final moments to bid one of the most joyous virtual place they have spent hours in goodbye. Granted that Club Penguin is technically still around – in the form of the new and advanced Club Penguin Island, the newer version is definitely a game that caters to a new generation of players and it does nothing for older players who just wanted to hop in once a while to re-experience the game or even to introduce their favorite childhood game to kids of their own. So, regardless of your reasons to revisit Club Penguin as it was, we’ve done the heavy lifting and have come up with 3 of the best cloned games that are operational right now and is 100% like the Club Penguin game of “ye olden times”. Check them out! Registering for an account in Club Penguin Rewritten is slightly troublesome because you will need to activate your account before you can join a game server, but aside from that, everything’s pretty standard – you use your email address to sign up and once you’re in, you get to create your penguin. While you’re doing that, you may notice that the game uses an older penguin creation screen, and you won’t be wrong there. 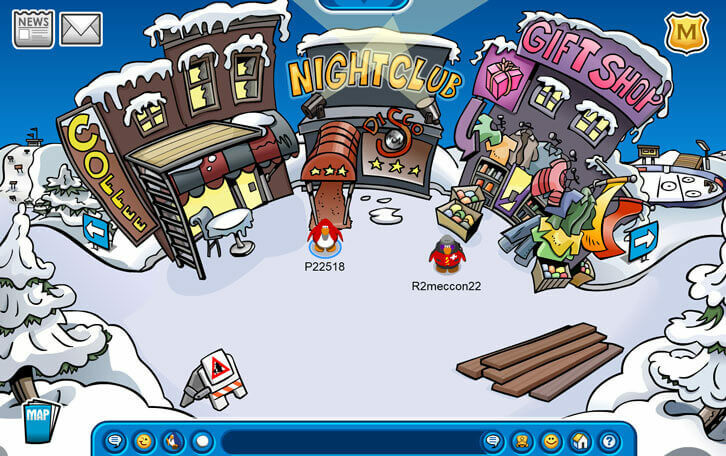 This cloned Club Penguin version is similar to the one at around the year, 2008. This becomes really obvious when you check out the map when you’re in the game. You’ll notice that the game lacks several locations that were added later on in the 2010s. By the way, like the Club Penguin back in 2008, Club Penguin Rewritten has pets for you to adopt, but if you’re looking for the newer ones, then you’ll be slightly disappointed. Now, once you’re done, you’ll need to choose a server and hop right in. This game offers 10 servers in total, out of which two of them are set at “Ultimate Safe Chat” mode. Take note that every server has “Safe Chat” restrictions on (meaning rude words aren’t tolerated), but servers without the “Ultimate Safe Chat” mode will allow players to manually type in the things they want to say. Not to mention, out of the 10 servers, 3 of them have pretty high player populations. Like the old Club Penguin, you can play this game via your browser. However, you will be required to download an Adobe Flash browser plugin if you haven’t already and due to this, it’s best if you use a more Adobe-friendly web browser like Firefox as opposed to Google Chrome. Club Penguin Rewritten managed to snag the first spot here mainly because it does seem to be the most happening Club Penguin clone there is! The game currently has its medieval-themed event going on full-swing, with tons of fun quests to do, dragons to slay, puzzles to solve, and free items (as rewards) to collect. Granted that the events do have a couple of glitches here and there, and sometimes, you may encounter lag, Club Penguin Rewritten is still really amazing especially when you compare it with the other games we’ll introducing later on. As the game currently exists under grace of the US’s Fair Use laws, the game doesn’t (and legally can’t) sell anything in-game for real money. So, basically, everyone’s a member here and there isn’t an activity or content that is walled off from a player. In essence, Club Penguin Rewritten is truly free-to-play. The game’s pretty generous too. Besides the usual 500 free coins, the game also gives you freebies (wearables) when you first logged in. You can even pick up free items by visiting places sometimes, but mostly, you’ll need to do something, such as completing an event quest, to get a free item. Last but not least, the community here is really great as well. Players are willing to help others through event quests or boss fights. They invite strangers and friends to party at their igloo, and they do chat quite a bit in public areas. The website where Club Penguin Rewritten is hosted has weekly contests and fun activities which engage its community and these features are crucial in ensuring the survival of this social virtual world game. Club Penguin Online, on the other hand, features a “newer” version of Club Penguin (the version the original was running right before it was taken down) and as such, offers a couple more content that Club Penguin Rewritten doesn’t have. This includes special pets-related locations like Puffle Wild and Puffle Park, as well as the Skatepark. You can even purchase more pets here too; You can adopt the Silver Puffle, the Blue Border Collie, or the Orange Tabby Cat in this game. That being said, let’s take a quick look at its registration process. Unlike the previous game, registering for an account here is really easy. There’s no email activation needed and you can start playing right after you sign up. The username you chose will immediately be shown in the game as well - this is something that the original Club Penguin doesn’t do probably because they have staff to scan through usernames to ensure none of them are offensive. Anyway, a quick tip for you – as the login screen (after you press play) is being loaded, there’s a part where no “loading” icon is shown and you’ll just be looking at a blank blue screen in the place where the game is supposed to appear. If that happens, be patient and wait it out – the login screen will load soon enough. Also, it’s best to play the game on Firefox because of the Adobe Flash plugin requirement. Club Penguin Online isn’t as popular as Club Penguin Rewritten, however. The game only offers 3 servers, out of which only 1 has a high player population. Interestingly, players in this game do talk to each other, but they seem to already have cliques that they hang out with. In other words, it can be slightly difficult to find new friends here. The game doesn’t seem to have events or quests as well, and this possibly explains why the game is markedly less populated than the one we’ve mentioned before. Don’t get me wrong – the game still has special event-related items available for sale (in exchange for game currency) in shops across the virtual world, but the game doesn’t have activities that will make these items relevant. For instance, wearing that brand-new medieval outfit you’ve bought while playing the usual mini-games in places that look like normal buildings doesn’t seem as fun as wearing exactly that but going on exciting dragon-slaying missions or hanging out with friends in a redecorated, medieval-themed Town. See what I’m getting at? Anyway, the game is still really fun to play but you might want to bring along some friends with you if you do want to try this out. Club Penguin Universe is pretty much an “odd one out” here. 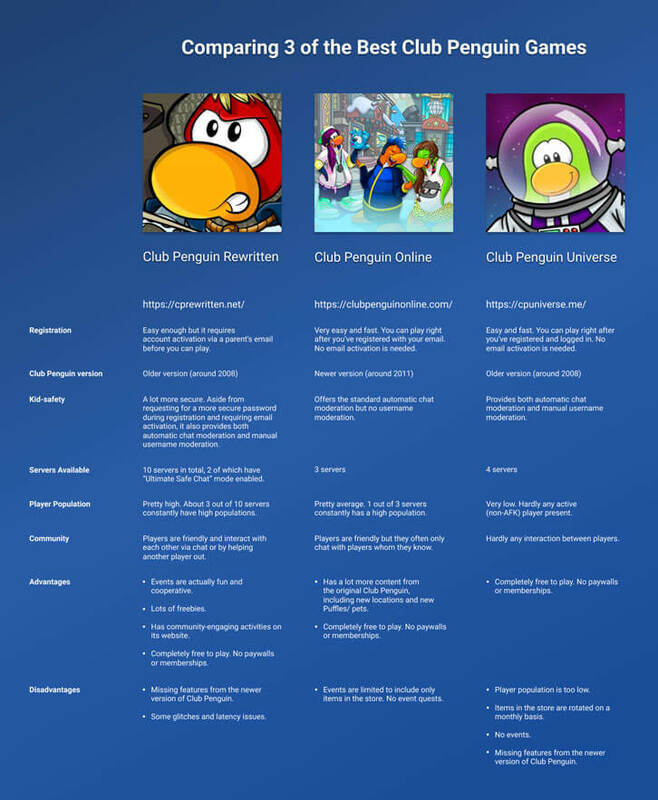 It is similar to Club Penguin Online when it comes to its simple registration process (you can skip a step by simply clicking on the Register link at the top part of the webpage), but it’s running the Club Penguin Rewritten (older) version of Club Penguin and hence, is missing some features that are later introduced into the original Club Penguin game. However, unlike Club Penguin Rewritten’s thriving player base and fun events, this game has neither of those. The game offers 4 servers overall, but the last I checked, all of them have really low player population (maybe it’s a time zone issue?) and I hardly see any player who’s not AFK in the game. The virtual items you can buy in this game aren’t as widely varied as in any of the previous 2 games. Instead, Club Penguin Universe employs a rotation system so if you want to buy an older item that you can’t currently find in the store, you’ll then need to wait for the next month in hopes of finally getting it. Like Club Penguin Online, this game doesn’t give you any freebies when you first log in, aside from the standard 500 free coins. Although Club Penguin Universe doesn’t really sound like much, it can be a great place to play Club Penguin in if you simply want to enjoy the mini-games without having to interact with too many “other players”. If you already have a group of friends and are just looking for a game to settle in, this game might be well-suited for you too. Now that you know all these info, hopefully you can make a decision as to which Club Penguin clone you’d like to play in. Have fun gaming and waddle on! Click here to view a bigger version of the image. P/S: If you would like to find other games that aren’t Club Penguin but are like the game, then you’ll want to visit our FindGamesLike website. It has the best – and we’re not exaggerating – games like Club Penguin list. Be sure to check it out!